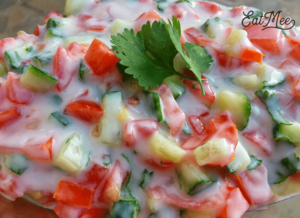 Tomato Cucumber Raita is a cooling salad or dip, most often eaten with curries or wraps. 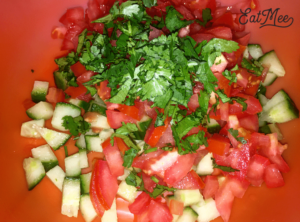 This recipe is so simple & will leave you feeling refreshed. 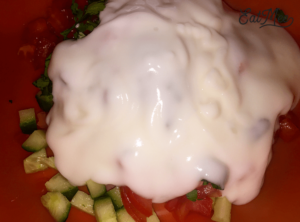 Raita is a typical name of a salad or dip from the Indian subcontinent, made with yogurt, which is also known as dahi or in South Africa as sourmilk (maas) known as curd. The word raita initially showed up in print around the nineteenth century; it originates from the Hindi language. The word raita in Bengali dialect & Hindi-Urdu is a subordinate or portmanteau of the Sanskrit word rajika, which means dark mustard, & tiktaka, which means sharp or pungent. In South India, particularly Kerala & Tamil Nadu, pachadi is known to be their traditional raita. 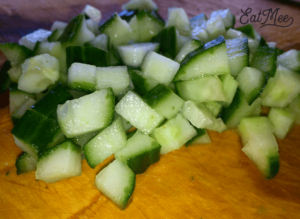 Rinse & cut the cucumber into cubes. 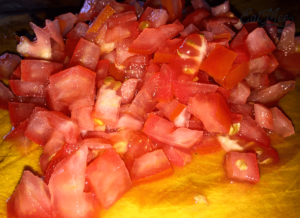 Next, rinse & chop the tomato. 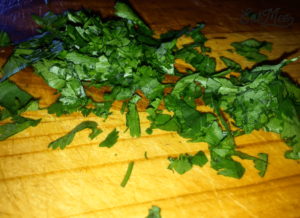 Rinse & chop dhania (coriander). Add the above ingredients to a bowl & season with salt as per taste. 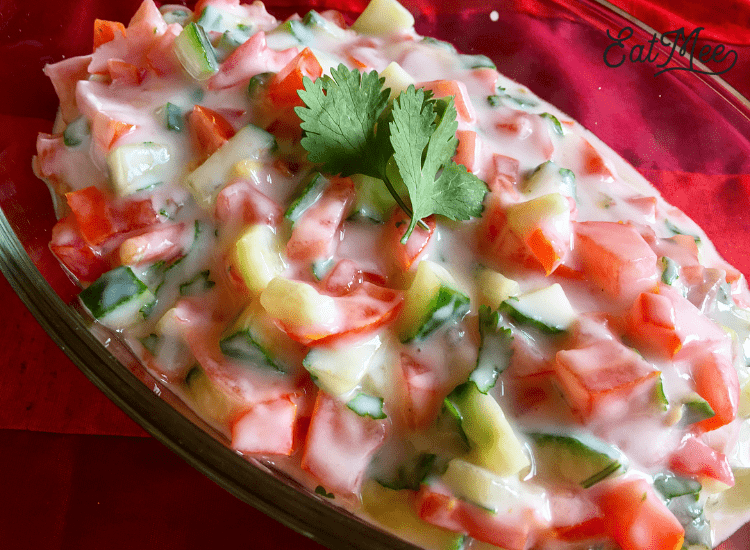 Serve this Tomato Cucumber Raita immediately. 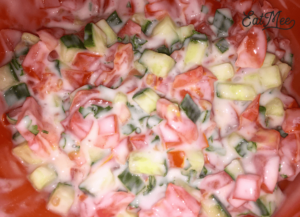 This raita can be stored in the refrigerator but after some time may become more watery from the tomato liquids, therefore its best eaten once prepared. Serve with biryanis (chicken biryani, mutton biryani, vegetable biryani & others). 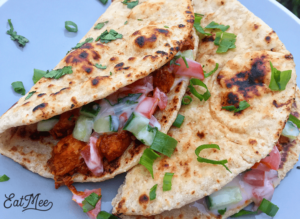 I have served it in Chicken Naan Fold Overs.